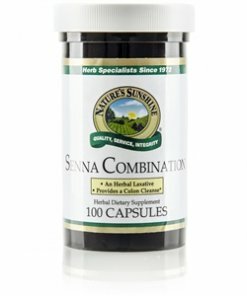 Nature’s Sunshine Senna Combination blends senna leaves, fennel seed, ginger rhizome and catnip leaves to provide optimal intestinal and liver support. The combination of herbs in the formula promotes healthy intenstinal contraction and regulates elimination. Senna Combination can be used as a laxative. NOTE: Pregnant or nursing women should seek advice from health care provider before using. If taking other medications or if any medical condition exists, seek advice from a health care provider before using. Use as recommended. Cease usage if diarrhea, loose stools, or abdominal pain occur or develop. Instructions: Take four capsules before bedtime. To be taken only occasionally.